Designed to provide maximum ballistic protection in a concealed format and provides the greatest surface area of ballistic protection in a standard concealable vest. The vest is flexible and lightweight and fits under a shirt or a blouse. 5" x 8" front pocket for optional insertion of trauma plate. The vest is NIJ certified to threat levels of I, II, IIA and IIIA and complies with body armour compliance 0101.03, and the new regulation standard of 0104.04.
of the wearer. Results of tests suggest a definite feeling of weight reduction. An additional modification to the vest is a three dimensional air pocket. This is attached to the rear and provides greater wearer comfort by evaporating excess body fluids. 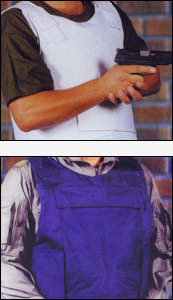 The incorporated modification provides a negligible increase in the weight of the ballistic vest.